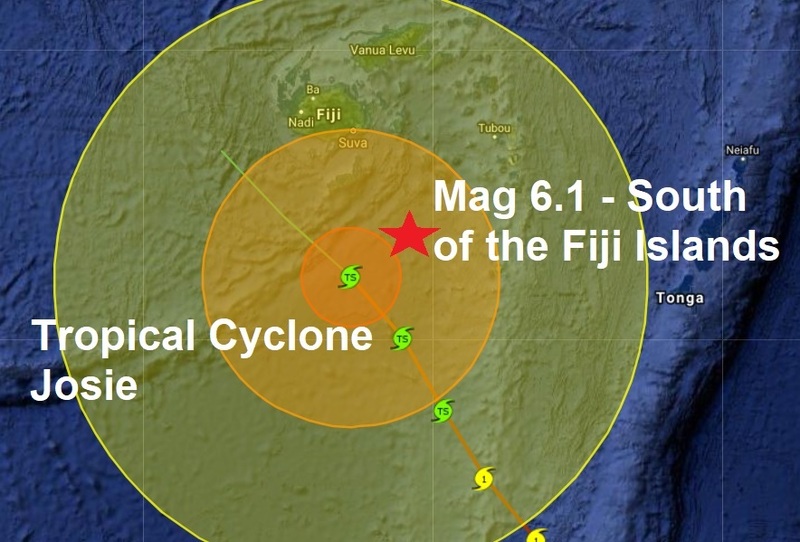 A magnitude 6.3 struck in the Pacific Ocean on Monday, 427 km southwest Southwest of the Fiji Islands the U.S. Geological Survey (USGS) said. Regular readers of The Big Wobble will be aware tropical storms, typhoons, hurricanes etc also influence earthquake activity and the major quake this morning struck almost dead centre in the eye of Tropical Cyclone Josie which last night killed four people with one missing. The major quake also struck as a northern coronal hole has opened up on our Sun. Of the 32 major quakes reported this year, 31 of them have occurred during coronal activity on the sun. Today's major quakes were the 9th of March and brought the total to 32 in 2018, 15 more than the same time period of last year.